The Red Paddle Company Explorer 13’2. By Far My Favorite Inflatable Paddle Board! Here at Northwest SUP & Fitness, we are very proud to represent Red Paddle Company inflatable paddle boards. My personal favorite is the 13 foot 2 inch Red Paddle Company Explorer. The Explorer comes with tie-downs for your extra gear both front and rear, which is extremely rare in an inflatable paddle board. It also comes with multiple hand grips for carrying ease, which is especially nice when packing into remote bodies of water. I’ve always been a die-hard fan of true fiberglass paddle boards. 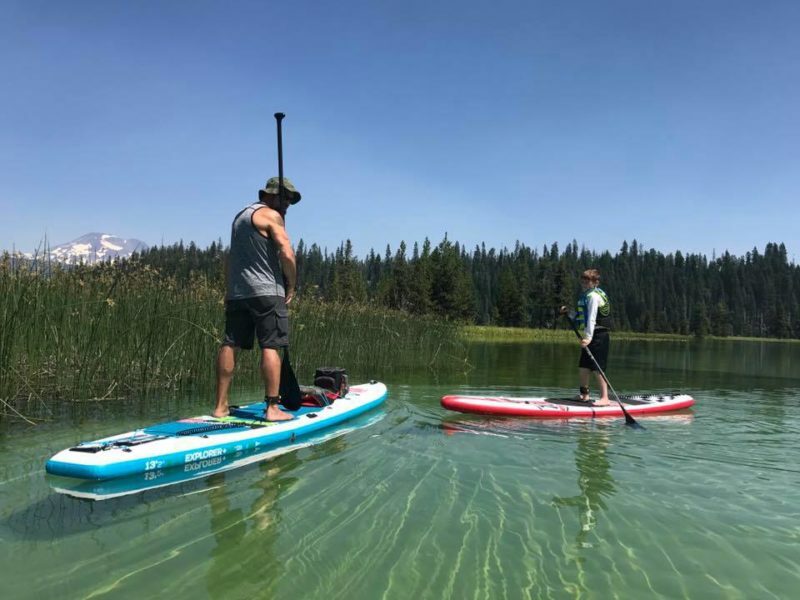 I had the opportunity to try a few different brands of inflatable paddle boards down in Bend Oregon on the Deschutes River. Especially for a guy my size, the knock-off brand inflatable paddle boards were a big disappointment, and were not even close to being comparable to any of my fiberglass paddle boards. They were about as stable as trying to stand on top of a pool toy, and they proved to be very awkward to pack once inflated. They were very slow to inflate and even slower to deflate, taking time away that would be much better spend on the water! They were very awkward and cumbersome on the water, difficult to keep in a straight line much less keep up with the rest of the group riding fiberglass boards. Luckily, there were a few nice folks on the river paddling on Red Paddle Company inflatables who offered me a chance to try their boards. I was instantly hooked! If you’ve been on the water much at all, I’m sure you’ve seen the “banana” inflatables. Don’t let yourself be lured in by the low price of the department store inflatables, you get what you pay for. On that note, while Red Paddle inflatables are going to cost you more than a knock-off department store model, they are considerably cheaper than other inflatable boards of the same caliber. The Explorer is by far my favorite inflatable paddle board I’ve ever owned! The high-volume Titan air pump makes pumping up the Red Paddle Company Explorer a quick & easy task. Red Paddle Company has some of the highest PSI ratings of any inflatable paddle boards on the market today. 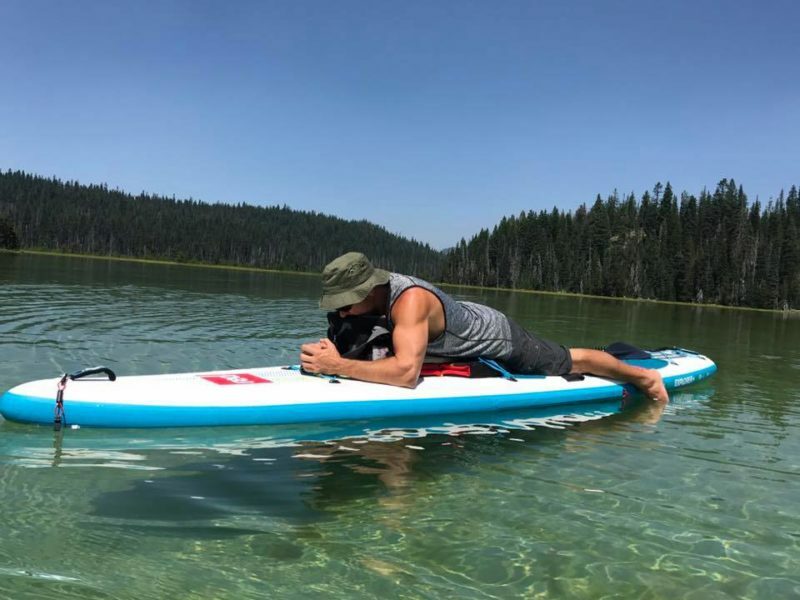 Their high PSI ratings combined with their unique frame stiffening system allows Red Paddle Company boards to offer performance & stability on the water comparable to a true fiberglass paddle board. The frame stiffeners are very easy to install, simply slide them into the slots along the sides of the board before the board is fully inflated. Between my body weight and gear, I needed a paddle board that could pack some serious weight and still perform. Red Paddle Company’s Explorer does not disappoint! The large cargo space with strap points both front and rear is a huge perk! I’ve had no problems packing a cooler on the back with enough meals and drinks to last me the day, while using the front cargo area for all my extra camera gear and a change of clothes & shoes for hiking once we reach our destination. While it’s certainly not as fast on the water as my Bark Dominator race board, it’s easily comparable to any of the other fiberglass touring boards in my fleet. The board is very responsive in the water and glides along with minimal effort. I’ve taken this board on long all day paddle trips I never would have considered an inflatable board as an option prior to my Red Paddle inflatable SUP. The supplied storage and transport bag is by far superior to any other bag I’ve seen from other inflatable paddle board manufacturers. It’s similar to any other high-end luggage, and can be carried upright or horizontally with handles provided for both positions, and has wheels on the base allowing you to roll your bag behind you easily. The rapid deflation valve and high quality transport bag makes packing up at the end of a long day a non-issue. This board has proven to be extremely durable and tough, and has held up through literally dozens of trips across the harsh lava rock bottom lakes surrounding Bend Oregon. Red Paddle truly thought of every last detail in their inflatable board packages, including an emergency patch kit! Even after 2 years of constant use & abuse, I have yet to need the patch kit. Currently, our entire fleet of inflatable paddle boards at Northwest Sup & Fitness consists of Red Paddle Company inflatable boards. For our fleet of rental boards, Red Paddle was the obvious choice. The extremely stable design allows for any skill level to feel comfortable on the water, and the proven durability means we don’t have to worry as much about damages to our fleet, especially compared to a traditional fiberglass board. They’ve been great for our yoga on the water classes, beginner’s group paddle events, and our longer group expeditions across the water. Another huge perk of the Red Paddle Company inflatable boards is the ease of transport. With a fiberglass paddle board, you have to take extra precautions during transport to avoid damage to the boards including bruising on the strapped areas of the board. Even with my Wife’s awesome lil Subaru Outback, the maximum amount of fiberglass boards we can take with us on a trip is 3 on top of the roof rack. With the Red Paddle inflatable boards, we can fit three or four easily stacked on top of each other on the roof rack, and another 4-6 boards rolled up tight inside their storage bags in the back hatch of the Subaru. For our larger group events, we use a 16-foot enclosed trailer. The Red Paddle boards can simply be stacked on top of each other with no strapping required when we use our enclosed trailer. 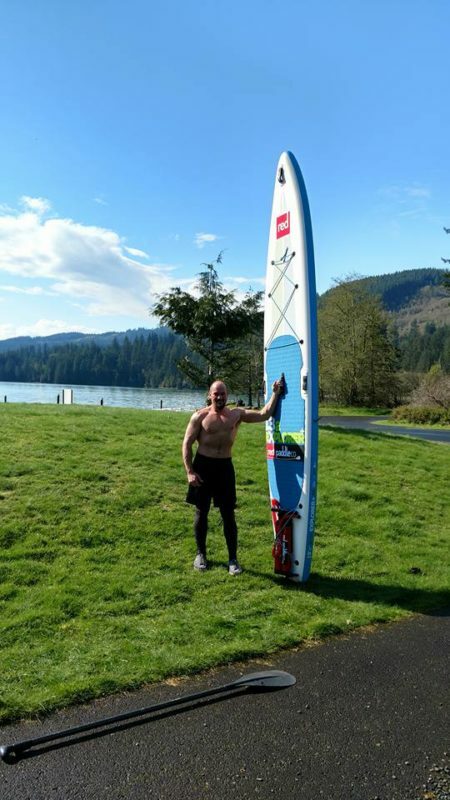 Using Red Paddle Co inflatable boards for our Northwest SUP & Fitness group events makes setup and unloading a very quick task, which means we can have our clients in the water and having fun within minutes of arrival! I’ve paddled nearly every brand and type of board on the market. If I could only own 1 board, the versatility & performance makes the Red Paddle Co inflatable an easy choice. Whether you’re new to the sport or a fiberglass veteran and are considering an inflatable SUP, Red Paddle Co will not disappoint! visitors would value your work. If you are even remotely interested, feel free to send me an e mail.